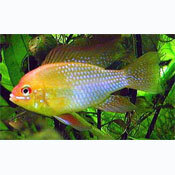 Peaceful dwarfcichlid that can be kept in a community aquarium together with other small peaceful fishes. The aquarium should be set up with stones, driftwood and roots, and on the sides and background densely planted, because they need hiding places. They are sensitive to changes in water chemistry. A regular small changing of the water ( 2 times a week) is necessary. The feeding of these fish is easy. Flakes, frozen and live-food are accepted. Breeding is in soft acidic water not very difficult. Up to 200 eggs are laid on a flat stone or in a cave. Both parents take care of the fry. The eggs hatch in 2-5 days and 4-6 days later the young are swimming free. You can feed them with baby brine shrimp. Easily spooked; place tank in an area with little or no traffic. Provide tank background—painted a dark color or given a scenic background.